Watering eyes is when tears are produced without any obvious reason. If you have an infection in your tear duct (through which excess tears drain from your eyes into the throat), it will need to be treated with surgery. Left untreated, the infection could spread to your eye socket and other complications such as corneal ulcers. Externally (from the outside, via a short skin incision). Fig.1. 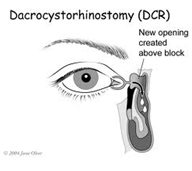 Diagram of Dacryocystorhinostomy (DCR) technique. During the first week after surgery you may get a little bleeding from your nose. In order to minimize this, you are advised to sit up rather than lie down, and to sleep with extra pillows at night. You must not blow your nose for one week immediately after your operation. After that you are encouraged to blow your nose to clear clots. Stay away from direct sunlight and bright lights. Apply no soap /shampoo and eye make-up for up to 2 weeks post-surgery. Avoid exercise and especially swimming for 2 weeks after surgery. Do not apply makeup for the first 2 weeks after surgery. You may fly from 7 days after surgery. You have uncontrolled swelling, pain and loss of vision (Extremely rare). You have nose bleeding that does not go away even after ice-pack application. You will be prescribed eye drops for three to four weeks and possible antibiotic tablets to take for 5 to 7 days. Some patients are also prescribed a nasal spray. Following surgery, the patient is discharged home if stable and instructed to rest for one week, without heavy lifting, exercise, or strenuous activity that may induce bleeding. Avoid swimming for first 2 weeks after surgery.